The church building is on the corner of the A30 and Pump Lane at the crossroads in the centre of Drift, TR19 6AA. There is a car park opposite. This is a small rural church situated 3 miles from Penzance on the very busy A30 road leading to Land’s End. The church building sits on a corner site at the crossroads in the centre of the village and a much-valued car park is just opposite our building. 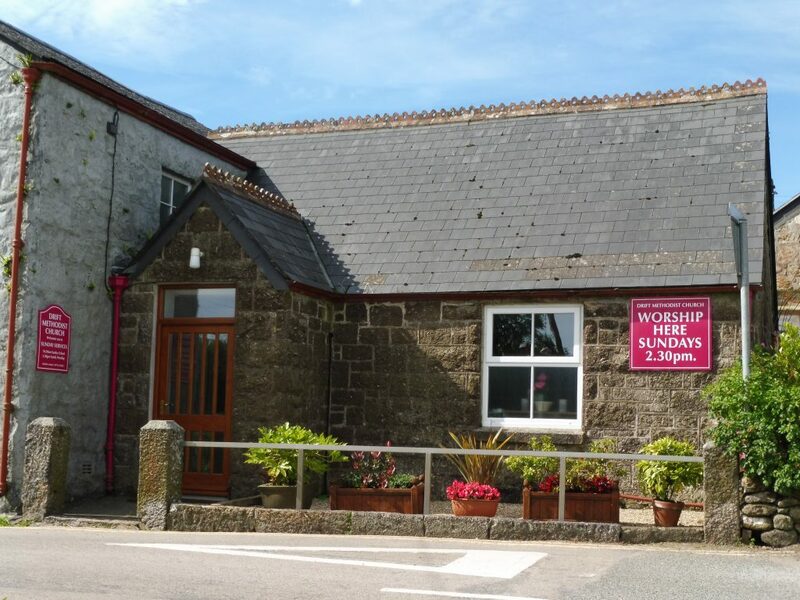 We are one of the six member churches of MAP (Methodists around Penzance) and this gives us an integrated access to the larger churches around Penzance which are all led by our minister, The Reverend Alastair Bolt. Our church family welcomes old and young alike and we all work in our pastoral areas within our community. We welcome everyone to come and join us here at Drift. The weekly service is held each Sunday at 2:30 pm and is always followed by tea/coffee, cake, biscuits and a ‘catch-up chat’. We also love to sing and visitors are often surprised by the volume and buoyancy of the joyful singing. Outside, the brightly coloured notice boards are a true invitation to come in and enjoy a time of fellowship and family worship with us. The summer visitor population have certainly taken up the invitation, enjoyed their worship time with us and returned again and again. A rural welcome is afforded to all, where we all are trusting in the Lord.